Scott and Lisa Donhauser are the owners of Craft and Cork Gastropub in Hamburg. After buying and running the well-known fine dining restaurant Daniels in December of 2013, which had been a staple in the Village of Hamburg for nearly 25 years, owners Scott and Lisa Donhauser felt the time had come for a change. Enter their new destination — Craft and Cork Gastropub — which opened on July 11 of last year. With their one-year anniversary on the horizon, change continues as the Donhausers give customers even more reasons to visit their unique culinary destination. Described as a lively yet comfortable gathering place featuring creative pub food, craft beer and cocktails, and a unique wine list, Craft and Cork also puts a lot of emphasis on the quality of their service, much like the fabled Daniels. The patio to which the owner refers is a new addition this year, complete with a warming fire pit. Located in front of the restaurant, the patio will be a great place to meet, relax and enjoy a conversation with friends. But at Craft and Cork, it’s the food that really has people talking! Scott spends the majority of his time behind the line in the kitchen. His passion for cooking became a big part of his life when he was younger and traveled across the country playing soccer. The need to take care of himself in the off-season and stay fit year-round was the driving force behind his decision to attend culinary arts school in Florida. After soccer, he found himself back in New York where he met Lisa at a restaurant where they both worked. Together with their dedicated team of employees, Scott and Lisa have added a lot of extras to their menu offerings, including a variety of popular weekday specials, a relaxing happy hour from 5 to 7 p.m. Tuesday through Thursday, and a weekend late-night menu from 9 to 11 p.m. every Friday and Saturday. Coming in May, Craft and Cork is planning a Cinco de Mayo Brunch from 11 a.m. to 3 p.m. Sunday, May 5 featuring a themed menu and a variety of drink specials. Guests who arrive wearing their favorite sombrero or poncho will receive a $10 gift certificate to be used on a future visit! Mother’s Day Dinner will follow a week later from noon to 8 p.m. Sunday, May 12. Diners will be able to choose from the restaurant’s regular menu or a special Mother’s Day menu. 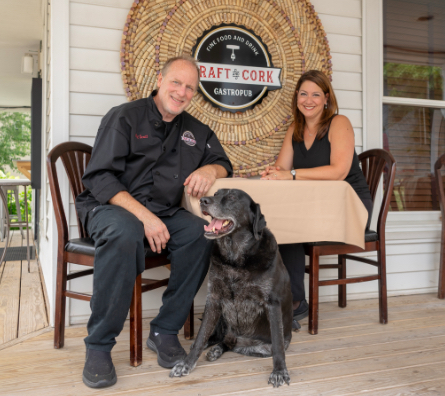 After Mother’s Day, Craft and Cork will close for a week so that the staff can enjoy some vacation time and begin to prepare for the establishment’s one-year anniversary. Craft and Cork Gastropub is located at 174 Buffalo St. in Hamburg. For more information, please call 648-6554 or visit www.craftandcorkgastropub.com. You can also follow the restaurant on Facebook for frequent updates. Be the first to comment on "As one-year anniversary approaches, Craft and Cork Gastropub is quickly becoming a destination"